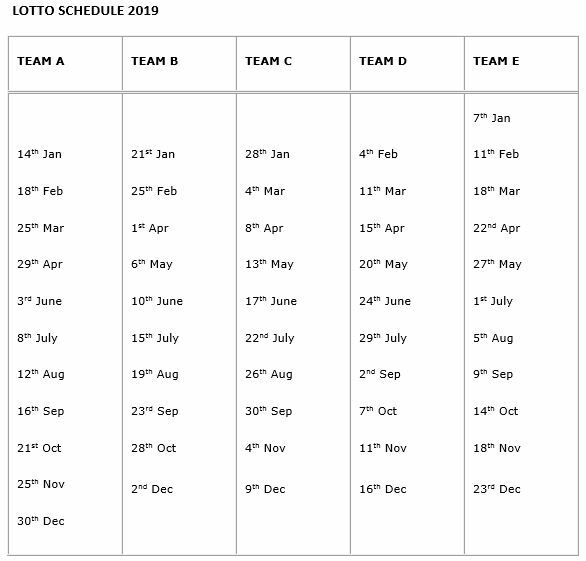 To play the Moynalvey G.F.C Lotto, four numbers are selected from 1 to 28. If anybody matches the four numbers selected on the night he or she wins/shares the Jackpot. Online Tickets cost €1 each. Offline tickets cost €2 for two chances. We encourage all of our friends and supporters to play the Moynalvey G.F.C fundraising lottery. We also hope that we can all work together to promote this lotto and help get back in touch with all members, ex-members and friends of the Club, from Moynalvey in Meath, who may now be living all over Ireland and the world. Team A – Leonora Walsh (Captain), Patricia Kelly, Fintan Lawless, Ray Mallee. Team B – Kathleen McDermott (Captain), Sean McDermott, John Smyth. Team C – Peter Brien (Captain), Peter Collins, Kathleen Little, Colette Duffy. Team D – Giles Drum (Captain), Paul Weldon, David Durkan, Mick O'Shea. Team E – Brian Conneely (Captain), Michael Conneely, Declan Smith. Pat Gilsenan, Brian Conneely, Kathleen McDermott, Peter Brien, Peter Collins, Giles Drum. *If unsure of whether draw is taking place etc, please contact your team captain or Pat Gilsenan. *If you cannot attend your draw, please arrange suitable cover. *Push standing orders as these guarantee income. Forms are available from Lotto Subcommittee or Pat Gilsenan. *Offer tickets for sales to customers in Fagans on night of draw before draw is made. *Remember – One extra book of tickets sold per week equals €1,000 extra income for the year.